Don't miss the next Sensory Friendly Film! in a safe and accepting environment on a determined by movie basis with the "Sensory Friendly Films" program. 10:00 am local time. Dates and films are subject to change. In order to provide a more accepting and comfortable setting, the movie auditorium will have the lights brought up and the sound turned down, families will be able to bring in their own gluten-free, casein-free snacks, and no previews or advertisements will be shown before the movie. 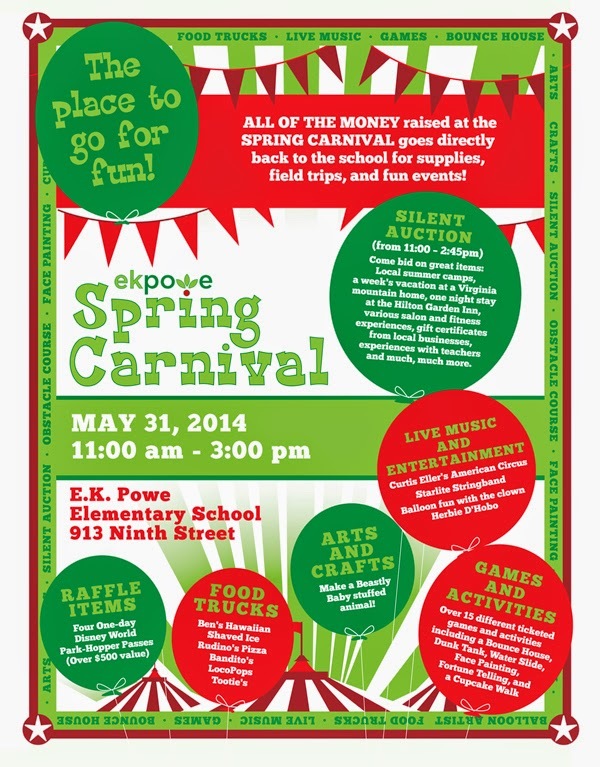 More Great Fun on Saturday May 31--EK Powe Spring Carnival! After you join us for the 100 Year Celebration for Cooperative Extension starting at 9:30 at Briggs Avenue Community Garden (Invitation to the 100 Year Celebration with Durham County Cooperative Extension), we highly recommend the EK Powe Spring Carnival--Food Trucks, Live Music and More! 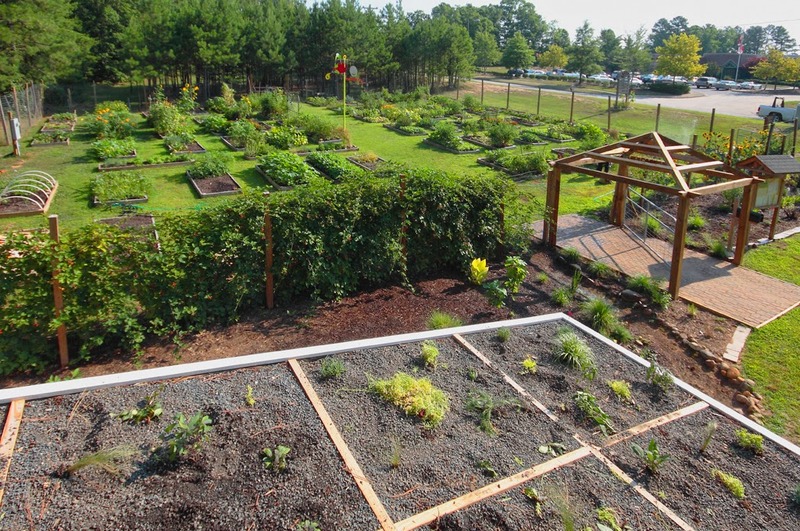 Join us on Saturday, May 31st for a 100 Year Celebration of Cooperative Extension in North Carolina with Durham County Cooperative Extension at Briggs Avenue Community Garden from 9:30AM-12:00PM. There is a brief special program at 9:45AM. Community members, partners, and friends are asked to attend. Please click on the link for your invitation and RSVP for the 100 Year Celebration! The end of the school year is quickly approaching and with that brings many tests for our students to endure. New legislation requires all high schools to administer final exams during the last five days of each semester. In addition, all schools will be administering end of grade and end of course exams. Due to policies set forth by the NC Department of Public Instruction, each of these tests require proctors (observers) be present during testing. This is where you come in! DPS needs volunteers to serve as proctors for all schools through June 9, but we have a greater need at our high schools. If you are interested in volunteering on the following dates please contact Regina Nickson at the phone and email below. She will send your contact information to the testing coordinator for placement. If you have any questions please contact your school or Regina Nickson at 919-560-2082. Thank you for taking the time to volunteer to help our kids get through the stressful end of the year testing process! This Wednesday, May 21, Triangle Orthopedics will be offering physicals for $10 at all of their locations. This may be the cheapest and easiest physical you will find. You don’t need to take a blank form with you (but you are welcome to), as this event is specifically for schools, and they have the forms. Please note parents do have to sign athletics forms. The 2014 HGSW Summer Experience: Cooking Recipes for Success will be held at the University of North Carolina at Chapel Hill from June 16th-20th 8:45AM-4:30PM. The application is due by 5:00pm on Friday, May 16th. This year there is a $35 program donation that HGSW asking for to offset costs, which will be paid upon acceptance to the program. Scholarships are available—so if a girl's family can't afford the $35, the program can be free! "Promoting Healthy Bodies, Minds, and Relationships for Girls"
There's still time to register for the May 18th FAN workshop, "Chronic Sorrow." Online registration is available through the end of the day on May 16th. If you are a parent of a special needs child then you are coping with multiple challenges which can impact your emotional well-being. Join us on Saturday, May 18th, 9:30-11:30am at Freedom House in Chapel Hill to learn more about these complicated issues and gain insight into ways to strengthen your coping skills. All of us at the Family Advocacy Network (FAN) hope to see you at this important workshop, offered free of charge. Space is limited, so please register soon! "Common Sense Parenting: Building Skills to Reduce Family Conflicts"
Parenting is tough, To help you fine-tune your skills from a common sense approach, the Family Advocacy Network (FAN) offers this workshop, facilitated by Linda Boldin, CSP and Ana Velasquez, FAN Advocates. T he Common Sense Parenting(CSP) training is an evidence based model developed by Boys Town and provides parents with instruction in areas of family communication, discipline, decision making, relationship building, self-control, and school success for families in all situations. Register today to attend this informative workshop, COMMON SENSE PARENTING, which will teach parents how to effectively parent children whose behaviors often cause family stress and household conflict. This workshop is offered free of charge. Dinner is included. There is no childcare. The Strengthening Families Program (SFP) is a free 7-week program for families with children between the ages of 10 and 14. SFP works to strengthen parenting skills, build on family strengths, and improve communication skills. This is a special age, come talk about it! There's still time to join. Start by May 20th. When: May 13th-June 24th: Tuesday’s 5:30-8PM. Where: Durham County Cooperative Extension, 721 Foster Street Durham, NC. ***Dinner, Childcare, and Transportation are Provided! Contact Lesley Franciscy at 919-403-8249 x229 to Reserve Your Spot! FEMMES is pleased to announce their fifth annual summer camp this year for rising 4th, 5th, and 6th grade girls beginning Monday, August 18th and ending Friday, August 22nd focused on Math, Science and Engineering at Duke University. Girls must be dropped off at 8:45 am each day and pick up time is from 4:30-5:00 pm. The camp is free, but participants must attend all five days of the summer camp. A light breakfast is provided. Students need to bring a sack lunch to the camp. Both the legal release form and the link to the registration form is available on our website, sites.duke.edu/femmes/summer-camp/ <http://sites.duke.edu/femmes/summer-camp/> . The camp only has capacity for 80 girls. Please register your daughter as soon as possible to ensure that she has a spot for the summer camp. The form will close after all of the spots are filled. Like FEMMES on Facebook at https://www.facebook.com/femmesatduke to receive up-to-date information about FEMMES summer camp and other activities and programs throughout the year! If you have any questions, comments, or concerns please email us, or you may call the FEMMES Summer Camp Directors, Natalie Williams [cell: (502) 594-5414], Colleen Chung [cell: (661) 340-1300 ], Jessica Prescott [cell: (480) 773-5699 ]. In celebration of Mental Health Awareness Month the Durham Community Collaborative is hosting a Training on Social Media, dealing with cyber bullying and other online safety concerns. No registration required. All are welcome. 10:00am - Noon, DPS Staff Development Center at 2107 Hillandale Road. Following, this month's Durham Community Collaborative meeting, there will be a one-hour training session on social media, cyber bullying and other online safety issues. Do you wonder about how decisions get made about School Lunches? Are you not always sure the meals we feed our school children are the best choice? On Thursday, May 15 there will be a Forum on Child Nutrition held in the auditorium at Rogers Herr Middle School located at 911 W Cornwallis Rd. There will be a 6:30pm presentation & discussion on DPS’ child nutrition program. • An exchange of ideas about how to collaborate toward the shared goals of supporting the achievement of the students of Durham Public Schools and nurturing life-long healthy eating habits. DPS is hosting a fabulous Advanced Adcademics (AIG/Gifted) EXPO tonight, May 6 from 5:30-7:00PM at the DPS Staff Development Center at 2107 Hillandale Rd. There is a speaker and a workshop on social and emotional needs of gifted students that sound particularly good plus a lot of great information about enrichment resources and what actually happens in the classroom with gifted learners. Have you ever wondered about the enrichment programs offered at various schools? Would you like to find out more about how educators are meeting the needs of advanced learners in DPS? Did you realize there are social and emotional needs that are associated with gifted children? Would you like to learn more about how to deal with possible issues related to the social and emotional needs? If you answered YES to any of these questions, go check out the EXPO tonight. Michelle Himmelman is an education consultant with Education Resource Group. She has a Master’s degree in gifted education and is the vice president of Guilford County PAGE. the social and emotional issues associated with giftedness. Be a voter! Vote today, Tuesday May 6, for the Durham School Board election and primaries in local and state races at your local precinct. Remember this is the actual School Board Election, not a primary. Board of Education members elected today take their seats in July. Don’t let less than 10% of our community make decisions about our kids’ futures. School Board elections matter for our community’s future too, whether you have kids or not. Please take the time to vote today!